Do it before you can't. We all have dreams and much too often they end up in the scrap heap or being shattered simply because we don't act on them. I believe in getting involved. Habitat for Humanity has been inside me for years and now it is out. March in Chile. Twelve Canadians, one of whom is me, and two Americans are going to Chile to try and make a difference, to allow a seriously ill child to live with his family in a home that he can call his. Our job will be to renovate existing homes to acceptable standards. In Chile, seriously ill children under treatment are not allowed to live with their parents and family if the home is sub standard. A lot of homes are sub standard and a lot of kids miss out because of that. 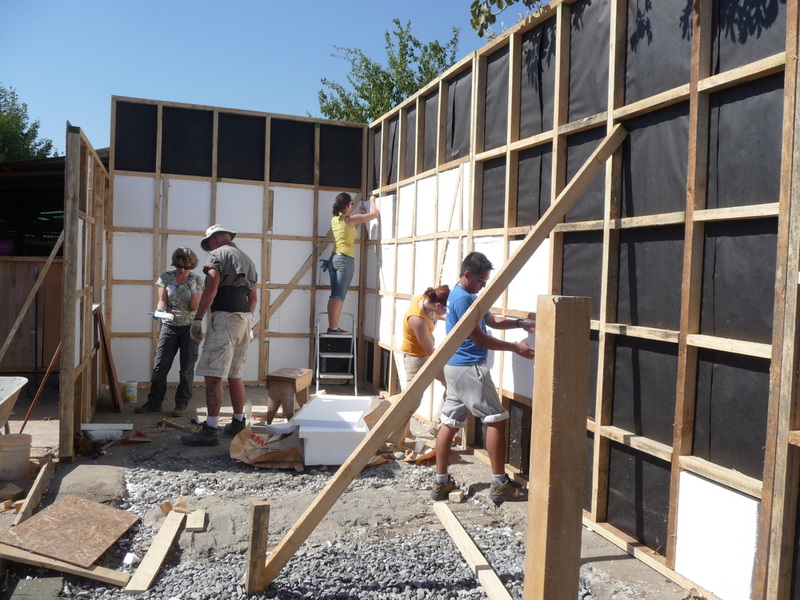 Here they are, a selection of pictures from our build in Santiago, Chile. The days were hot and long and the work was tiring but in the end it was more than worth it. The satisfaction, was and is immense. The build far surpassed my expectations. Emotionally, spiritually and physically it was one fantastic time. Meaningful beyond words. The welcoming sign that greeted us on the first day of the build. Before we got there Habitat Chile inspected the house and the decision was made to alter our build. It went from a renovation to a new house. Parts of the original home was demolished leaving a large pile of debris that was later trucked away. The site was meticulously cleared leaving us with an unobstructed area to build the new home. The white wall is the exterior wall of the neighbour and the brick wall is the back of the lot. Our first task was to dig the footings. A labourious job. Here Leslie, in the foreground, and Tim, and Jenna take their turn. That's Sebastien who Tim is talking to. Sebastien, a Chilean, is the translator assigned to our team. He lived in Canada for a year or so and has a girlfriend in Quebec City. He hopes to return here before the year is out. Jack was the oldest member of our build at 71. He and his wife Diane have done several builds around the world. Jack and I spent a lot of time together feeding the cement mixer. The always busy Manolita just had to take a turn with the wheelbarrow. One of his favourite things was to climb onto the load of stone in the wheelbarrow and be take for a ride. That's Jack and me. We spent parts of three days filling the monster with stone, sand and cement. Hard work in the heat and sun. Yup, occasionally we sat down on the job. Jack and I were waiting for the wheelbarrow to be dumped before starting on the next load. The footings are well on the way to being finished. Once they had set the walls would go up. Emma, Raoul and Michelle work on walls. Emma and Michelle are mom and daughter. The first wall being set in place. The walls were put together on the ground and then lifted in place. It was quite a job as they had to be held upright and then lifted high enough to allow steel rods to be put through the bottom plate. That's Kate, Leslie, Hannah, Emma, Jack, Tim, Me and Julien. Raoul, in the red bending down and Victor in red hat at the back left were the Habitat maestros in charge of the build. The family was watching in tears as their dream started taking shape. Over the course of the build we made and erected 11 of this type of wall and then built four partition walls inside. The house has three bedrooms, a common room and a bathroom, which can be seen to the left in this photo. That's little Manolita with dad Pedro. The sewer pipe has been laid but not connected yet and the wire in the background was used to reinforce the floor. All of the walls were erected and the drywall put up before the concrete was put down for the floor. This shows the site as the footings are being poured. That's Tim on the left and the walls in the foreground are finished and waiting for the footings to dry. Time for a break. It was one of the cement mixing days and the sun was pretty hot. That's Maestro Victor installing a wall support. The gang got together for a photo op after the exterior walls were erected.The blue shirts were given to us by Habitat Chile on orientation day. We also had red shirts, which were given to by Habitat Canada - Global Village. You can't have a building site without a flag. The Chileans took care of that. It was a proud day. This was a very emotional moment for me. I took Pablina out. She weighs about 100 pounds and has to be carried. While she can't hear or see she clearly enjoys the contact and sometimes it seems like she is quite aware of what is happening. A white Styrofoam-like product was used for insulation against heat, cold and noise. The same stuff was used in the ceilings. The diagonal bracing you can see on the end wall is there for earthquake stability. Each piece of insulation had to be cut to size. That's Jack and Michelle on the left, Kate and Leslie and Sebastien, our interpretor, on the right. We installed the drywall but the family was going to paint it after we left. They wanted to add the finishing touches to the house. What a neat day this was. It was March 21 and that is Downs Syndrome awareness day. Manolita is one of three poster kids being used to promote the day. The family was pretty darn proud. So were we!! Those are the posters that are being held by the family. Things are getting close to being finished. The siding is a cement board that will be painted. Julien, one of the site leaders, strums while waiting for lunch. Yellow, you say.The paint was poured into a very large stainless steel mixing bowl. Here, Kate, on the bench, Leslie (centre) and Jenna put the finishing touches on the building. The kitchen. Lunch is being made. Most days the women cooked food for 24 people. Quite a job in a kitchen like this. What you see is what there is. While there is running water it is only cold. The counter space is right there in the foreground. To the left, out of the frame, is where the television is located so the kitchen also becomes the TV viewing room. There is nowhere to sit. Our work is done. This is the afternoon of the last day and we are gathered for the dedication ceremony. That's Julien on the right and Sebastien, our interpretor on the left. Very moving. 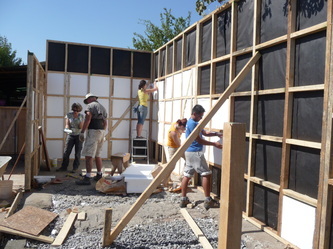 We didn't get completely finished so a crew of Chilean Habitat volunteers came in and put up part of a roof and then built a new bedroom (where we are sitting) that is attached to the old house. Pedro, Karen, Manolita and the other two kids live in the house we built. Grannie lives in the new room attached to the old house and Pablina and her mom live in the old house. Prior to this everyone lived in the old house. The communal kitchen and dining area is still in the original house. Karen cut the ribbon to the new house and everyone who worked on the build was given a small piece as a souvenir. And here's the gang. 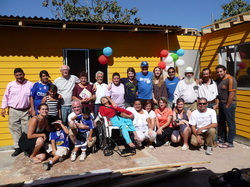 You have to have that last photo.This is everyone who worked on the build - our team, the Chileans and the families. Kate and Carlos share a moment. Carlos is Pedro's dad, Manolita's grandfather and lives nearby. One day he showed up at the site with a loaf of bread he had made for everyone. He was a wonderful guy. The closing BBQ. That's Steve throwing a bunch of sausages on the BBQ. We were served sausages, chicken, beef and pork as well as green salads, potato salad, salsa and copious amounts of Chilean wine. What a night. Afterward we went to a local club and danced the salsa until the wee hours of the morning. The picture was taken from my bedroom window at the hostel. That's Fred, my roommate, on the end to the left. Jenna is in red, Emma, Kate, Pete, Cal, Dianne and Jack. What's Chile without an earthquake to entertain? This morning we got it. It was 4:27 to be exact when a sound sleep was interrupted with the hotel shaking and with the feeling that the walls and ceiling was going to rain down upon us at any moment. It didn't happen, of course and the danger waned after 15-20 seconds. We later learned that the quake was centered just 50 K or so away in the little town of Casablanca, where we had been just seven days ago. The quake registered 5.3, small by Chilean standards but quite real for us since the epicenter was so close and relatively shallow - just 67 K below the surface. And, of course, there was the concern that it might be followed by others. But before the quake hit came a few days of shutting down our part in the build. Work came to an end Thursday. We drove away from the city satisfied with what was accomplished even if the work wasn't totally finished. When we arrived two weeks ago there was a vacant piece of land waiting for us. During our time we dug footings, mixed and poured the concrete, built walls, poured a cement floor, put up a roof and ceilings, insulated everything, drywalled, installed a bathroom, installed windows and installed and painted the siding. It was an IMPRESSIVE amount of work. 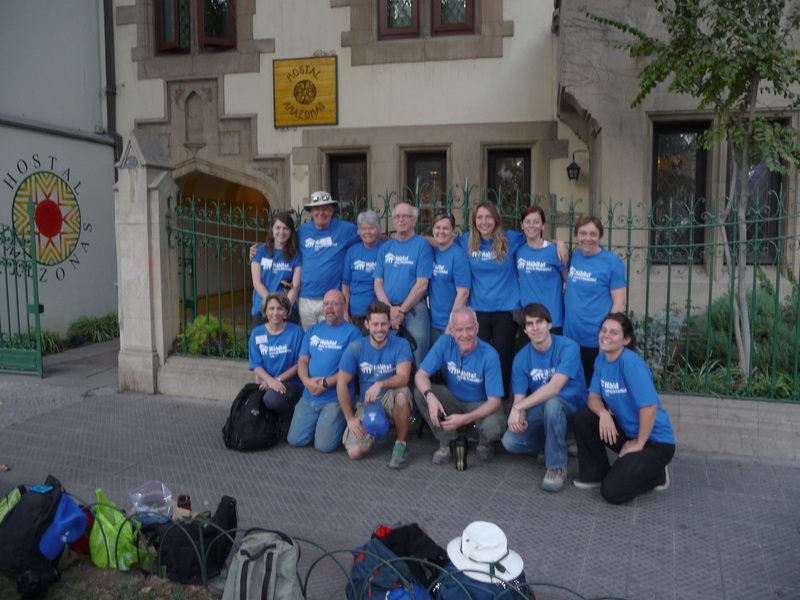 And while all that was going we worked with and made friends with a wonderful family, some of their friends and a handful of Chilean workers from Habitat Chile. This part of the build was beautiful and heartwarming. Our last day on the job was frenzy of activity designed to get as much done before we had to wind things down. We didn't get everything finished - the clock worked against us. There was a little bit of roof and ceiling work left for Habitat Chili volunteers to do. They finished that by Saturday. A new bedroom planned for the back of the original house got left behind, although we did pour the footings for it. Habitat Chile began working on that Saturday and we were told they expected to have most of it finished by Sunday night. It was replacing a room that had been torn down just before we arrived. it was too decrepit to even repair never mind sleep in. The family requested that we leave the interior painting to them as they felt the finishing touches should be theirs. Our last official event was a huge BBQ at the site of a Chilean charity called FEDES, an organization dedicated to making the lives of the poor better. It works with Habitat in Chile. The BBQ featured sausages, chicken, pork and steaks and the requisite copious amounts of Chilean wine. There was music and speeches and a very good time. Afterward we retired to a nightclub where we danced the salsa until the wee hours of the morning. It was a day that wandered toward its end with highs and lows and ups and downs sprinkled throughout. It started with a never-ending steam of traffic jams that cost us an extra 15 minutes and ended with an equal number on the ride home. Believe me sitting in the back of an un air-conditioned Hyundai van in sweltering heat and choking smog is not a fun way to start or end your day. Santiago's smog obliterates mountains and has left more than one member of our team coughing for the past few days. The smog and the dust and grime from the work site are quite a combination. Oh for a clean pair of work pants. We did make it to the site and with it came the realization that we wouldn't get finished before we had to head home. For sure we had made great strides as we started with a patch of bare earth and in just a few days had built it into a house with three bedrooms, a bathroom and a common room. There is a concrete floor where there had been dirt; walls, a roof, ceiling, drywall, electrical wiring, plumbing and siding where there had once been air. But the fourth bedroom to be attached to an existing structure had not gone beyond footings. We have run out of time. There is only one day of work left and four days of work to do. What followed were a series of highs. They started with a with a teary-eyed chat with Karen. She is Manolita's mom. 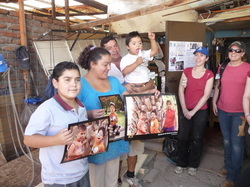 Manolita is the little boy with Downs Syndrome and now-healed third degree burns on his chest. Karen is quite simply a sweetheart. She's always happy even with what she lives with. Manolita is cute but a handful. Mom can't understand why a group of us from Canada would rather be helping her family than be on a beach somewhere. She looks upon us as a gift, the angels sent by God. In her few words of English and my three words of Spanish we talked. She told me how much this meant to her. Tears came to her eyes, which brought tears to mine for what seemed the 100th time since this adventure started. This family works so hard. They are so deserving and for the first time in their lives Karen and Pedro (he's the dad) and their two kids will have their own home apart from grannie, sister and her brood, one of whom is Pablina who lives with cystic fibrosis, brain damage, deafness and no sight. Then came news that Pedro had found a job after months without work. It isn't much by our standards but it is work. He won't make much more than most of us spend on coffee every week. More damn tears. Not enough? Sorry, it gets better. Manolita came home from his special school today with a face painted black and full of more piss and vinegar than usual. March 21 is Down's Syndrome awareness day in Chile and Manolita was made one of the poster boys. The black face was what was left of a party to celebrate the day. Karen made a beautiful talk about the meaning of the day to her and the family which brought tears to everyone's eyes. Have I said they are a special family? Then Jack, one of our team, spoke about how he had befriended a young woman with Down's and for 35 years he and she met on a weekly basis. She died as the oldest known Down's Syndrome sufferer in Ontario. Bloody hell, we all cried once more. We had hardly put the Kleenex away when the city's deputy mayor showed up to have a look at our work. Along with him was the city's chief of social services. The family, we were told, was to be monitored regularly. They were going to have someone looking out for them. You know what that news did to the crowd. It was back to work. With only one day left on the site everyone knew that an extra effort was needed. The heck with the heat, damn the discomfort and the sore muscles. The house came first. It was a day that saw the siding finished, the ceilings installed, sound insulation put in place, plumbing finished, flashing hammered on, doorways squared up, windows in their openings and electrical wiring strung throughout. Raoul and Julien relax with a smoke during a morning break. The exterior cladding is going on. The next day the windows went in. 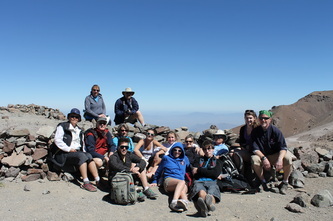 We are about 11,000 feet above sea level when this photo was taken. The build is moving along at a great pace. The footings have been poured, the plumbing pipes are in place and about one-third of the floor poured and all of the gravel and mesh is down on the part of the floor that isn't filled with concrete. As you know, we are building four bedrooms, a common room and a bathroom. That means a lot of walls - 15 I think. We have now installed and insulated six of them. Over the weekend a few local volunteers were to be on hand to build some more partition walls and perform some other jobs. We will find out exactly what they did when we show up on Monday after a few days of sightseeing and rest. During our time off we spent a day touring and exploring Valparaiso and Vino del Mar, a pair of sister cities on the coast a little more than an hour west of Santiago. What an extraordinary pair they are. Valparaiso is beautiful. No matter which way you turn there is a picture splashed with colour and beauty. It's a town best suited for lovers with a spare week on their hands.. Vino del Mar has a beach, no, make that two beaches. The sand is soft and warm and deep. The ocean, while a tad on the cold side, is refreshing. We spent a fine few hours in the town firstly over lunch and then wandering along the beach. Delightful day. Sunday, though, was the day. We drove an hour and a half out of the city to La Parva, a mountain area with peaks in the 3,000 to 4,000 metre range. Getting there was an eyeopener. Switchback on switchbacks, cliffs that plunged several thousand feet below us and guardrails, when there were guardrails, that wouldn't hold back a SmartCar never mind a Mercedes Benz Springer with 15 people aboard. We swayed and swooshed our way up the mountainside for about an hour regularly brushing by the 100s of cyclists making their way up the mountain. Juan, our guide and driver, says he has made the trip 100s of times, was still alive and felt that he had at least one more safe trip in him. There were times we weren't so sure. After parking, we took a chairlift another 900 meters higher and then spent three hours or so exploring the top. The terrain is quite dessert-like with nothing but a few patches of lichen for vegetation and rocks and sand as the main. It was rugged and beautiful. The eye was filled with coppers, greens, beiges, blacks, browns, blues and whites as the sand, vegetation, rocks, sky, glaciers, clouds and snow held court. Some of the troop headed up one peak while others went down into a bowl that fills with spring water from the melt but is empty now. The fall season is about to end and winter is about to begin. Those that went up had more spectacular views. They also witnessed Leslie spread a vial of ashes over the mountaintops. Her husband passed away a short time ago and she was taking him to some of his favorite places and to places where he always wanted to go. On our few days off we also managed a bicycle tour of the city and a visit to Cerro san Cristobal, where a 14-meter high statue of the virgin stands over the city. She is on top of an 800 meter high mountain. Unfortunately, the smog that envelopes the city most every day obscured the view somewhat. Our weather remains nothing short of amazing. Sun and heat have been the order of every day. Wednesday the high was 42. Every other day it has been a few degrees on either side of 30 except for the hike on top of La Parva where the winds howled, the sun shone but the temperatures were cold enough for us to have to wear jackets and, if we had them, gloves and mitts. It's Tuesday night, closing in on midnight and I am still awake. This, despite the fact we have had two nine hour days of slugging away in scorching temperatures and brilliant sunshine at digging footings and drainage ditches; building walls for later installation; mixing cement; moving truckloads of building material; and heaving rock. I should be tired but I'm not. The impact of what we are doing is hitting home. I can't say how many times tears have played havoc with my vision or that lump in my throat has made speech impossible. This is real. That girl rolling on the floor over there is real; her name is Pablina and she has cerebral palsy; the fact she can't see is real; that when you call her name and she can't hear is real; that her mom carries her everywhere is a fact; that her brain fires on very few cells is evident. Out front, playing in the street, is her cousin Manolita. He is five-years-old and not only has Downs syndrome but also has a body that was severally burned a couple of years ago after a kitchen accident. Twenty per cent of it was burned. Manolita is happy and smiles all the time. Pablina, well you just don't know even if it does look like a smile. He gets into everything. She can't. A high five is part of life with him. If she raises a hand it may well be that she is trying to injure herself. The two kids live in this place with six others. He has a mother, father and two siblings. She has a mother. They share a grandmother. 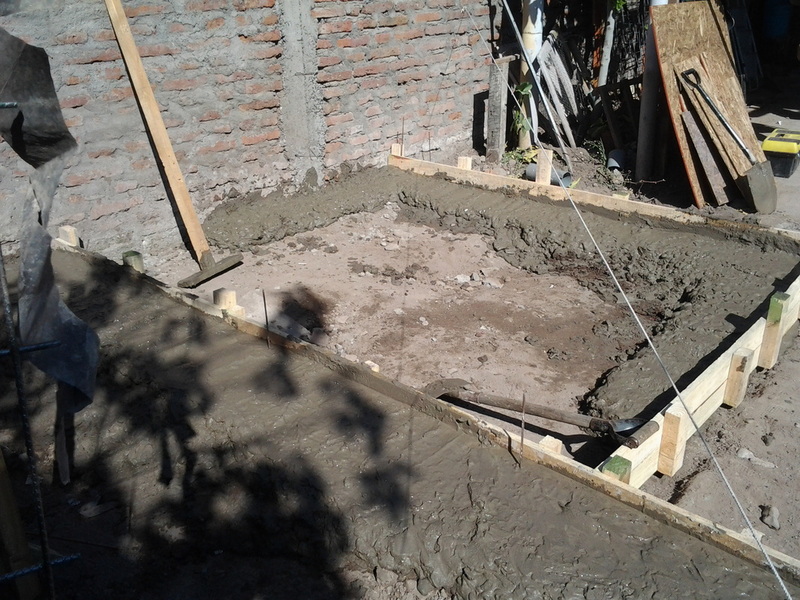 Originally, we were to have renovated their home in San Bernardo,one of the poorest areas in all of Santiago. That changed when it became apparent that renovating wouldn't do. Most of the house was torn down. We are building new. The kitchen, a bathroom, one bedroom and an eating area were left standing. The rest is gone and in its place in just two weeks we hope to have six rooms completed. Four will be bedrooms, one will be a bathroom and the other will be a common room. The girl and her mom will live in the old part of the house, grannie will have her own room and the boy, his brother and sister and parents will live in the new section. The kitchen ad eating area are common. All of this is on a plot of land not much wider than a Barrhaven driveway or longer than three Cadillacs parked nose to tail. San Bernardo is about 40 kilometers from our hotel and takes half an hour to an hour to get there depending on the rush hour traffic, which can be quite dense. No one had to tell us when we hit the borough - street after street of no vegetation, of tiny little houses which are a slight grade above shacks. They all look the same. Everywhere there are wild dogs, which is true of downtown Santiago too. The are literally thousands of dogs. Interestingly, I have yet to see a fight and rarely do you hear any barking. Sunday, we watched one get onto a bus. It is strange. Our family is wonderful. I have never seen people so happy. Eyes are bright and smiling and welcoming. There are always welcoming hugs and kisses. The food is plentiful and seems to always be there from the good morning fresh-baked apple pie to the sandwiches piled high for our afternoon break. Lunches are set out on the table with about 20 people around in. The fare is typical Chilean - a corn and Dan dish topped with tomatoes, onions and salsa on Monday and a spaghetti topped with a sauce very unlike any we would get in Canada but delicious just the same. The work isn't difficult but it is hard. Everything is done by hand. We have two power tools on site. One is a circular saw and the other is the cement mixer. Monday I hammered nails for about six hours. We were building walls. In the afternoon it was digging ditches to pour the footings. Tuesday it was the cement detail. For more than seven hours Jack, Leslie and I shoveled sand, gravel and cement into the mixer. The sun was relentless and the heat was intense. The footings were poured by 5 p.m. That's when we got to dig some more. There are a lot of tired and hurting muscles in our group but other than a few blisters no serious injures although a tumble from a ladder Tuesday morning to one of the Chileans was scary and left him with a bruised leg. Pablina came into the yard and joined us for 20 minutes or so Tuesday. Because she can't see or hear and crawls on her bum and rolls when placed on the ground it is a dangerous place for her. Everyone was around, reacting with her. She seemed to see or even hear us but that probably wasn't the case. Most likely she was reacting to the vibration in the air, which was pretty intense. (Hell, my eyes are watering and my throat is bobbing as I think about it). Her presence drove home exactly why we are here. Wednesday is supposed to be the hottest day so far. Our job is cement. It ought to be fun. There are about 7 million people living here. Their dinner plate is primarily filled from the largest, most awesome market there is. 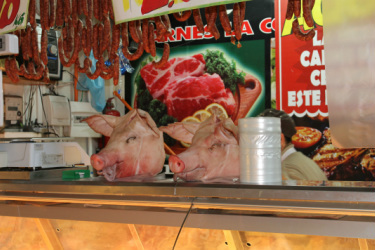 Spread over, I'm guessing, four square blocks in the Recoleta district, the Vega market blows you away with quantity, variety, size, colour, activity, business, noise.... Heck, you get it. It was sensory overload of the best kind. Friday, It took three hours to get through what we thought was all there was to see only to find out when we got back to our hotel we learned that we had missed an entire section - the fish market, which is supposed to be a major experience in itself. The afternoon was spent on a second walk, this one guided, that lasted four hours and took us to many of the major political and social-economic sites in the city. It was quite amazing. Especially on a day when the temperature hit 36. Saturday was another scorcher and another day of walking. Fred, Dianne and I headed back to the market area to go through the fish market, which we somehow missed Friday. It was a good move as the fish mangers put on a show that was pretty neat. 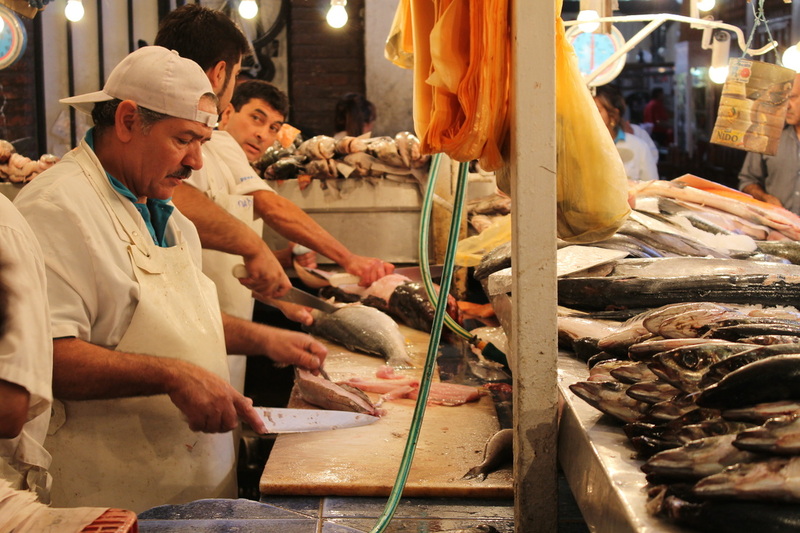 Dozens of fish stalls surround a central court of seafood restaurants. I can't even begin to name the various type of fish on display but there was everything from eels to bass to shellfish, crabs, octopus and so on. Watching the men filet was quite something. We had lunch there - a stew of 12 or so different fish, shellfish and so on. The last three hours were spent wandering around parks, the arts district, markets and so on. Friday night three more of the group joined us in Santiago. The aforementioned Fred flew from a build in Bolivia (he's my roommate) and Pete and Kate, our team leaders, arrived from Argentina. Another five are expected later today with the remaining stragglers scheduled to join us Sunday. Our first meeting as a group is set for Sunday night before supper. That meal is served late. Most certainly after 8 p.m. And more than likely after 9. By the time this guy is finished eating it is time for bed. 35 degrees and counting!!! That is what met us when we arrived in Santiago Wednesday afternoon. It was a blast furnace made somewhat livable by the fact there was very little humidity and that the infamous smog the city is know far seemed trapped in the mountainous area near the airport. The traffic is a little crazy - fast and furious - little regard for lanes, signaling and a passenger's fear. Only Dianne and I are here from our group. The others are scheduled to arrive over the next few days. The largest group is to arrive Friday. The hotel, more like a BandB, is pretty well exactly as portrayed on its website. The staff is super nice, all women so far, and the common areas are comfortable and fun be in. 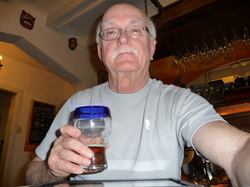 At the moment I am enjoying a cold one (kunstrmann pale ale). My room is rather small but that will change Sunday when Fred and I move into together. We are heading out to dinner in an hour or so, which hill make it about 9 p.m. It's a late eating country. A walk around a limited area of the city this afternoon revealed it is a city of monuments and it's history. There are statutes everywhere - old and new - with independence and revolution dominating. 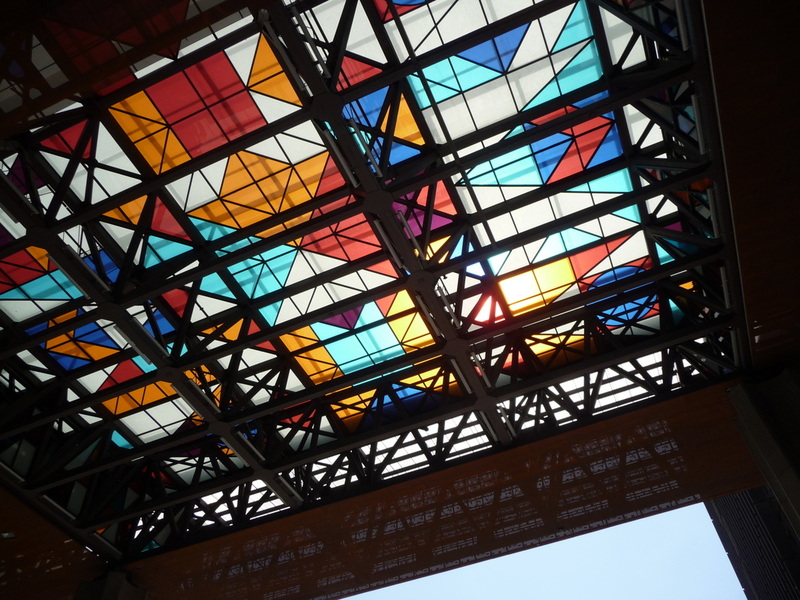 One of the more fascinating sites was an arts centre with splendid multi colored roofs, and stamped steel siding. Today, there are two displays there of the violence and overthrow of the 70s. I just gained an hour of time in Chile. My return flight was moved back an hour on the 27th to 1:40 p.m. from 12:40 p.m. I have no idea how many times I have flown in my 64 years but I can't recall ever having had a flight time changed before this. I guess when they tell you to check for changes they mean it. It's Tuesday and flight time is near. My flight out of Ottawa is scheduled to leave at 8 p.m. Wednesday and at 11:45 I head to Santiago on a 10-hour overnight flight. UGH!! I am well organized, except for a hat which I am going out to get in a few minutes. Last Saturday night Barb and I attended a Habitat Global Village fundraising dinner. It was the first 'alumni' dinner ever held in Canada and the head of Habitat says the dinner concept will be spreading across the country over the next year or so. I was surprised to learn that here were about 60 Habitat chapters in Canada. Proceeds from the dinner went 2/3 to the Ottawa Mission and 1/3 to a Habitat fund that has been started to send one high school student on every build organized out of Ottawa. A great idea. The meal itself was catered by the Mission. A very nice pasta meal. The Ottawa chapter has quite a few builds planned this year including El Salvador, Africa, Cold Lake Alberta, Iqaluit and several in this area - Carleton Place, Orleans and a continuing build going on in Kemptville. There may even be one in Perth, which will be sponsored by a chapter headquartered there. Not too many more days before the start of this 'my excellent adventure'.The team members have been busy corresponding and getting to know one another. Our team leaders, Pete and Kate, have arranged activities for our four R and R days. We have one day of hiking in the Andes booked; a bicycle tour of several wineries; a bicycle tour of Santiago and a day at Valparaíso.I will be arriving in Santiago a few days early and staying a few days later. Dianne, Fred and I plan on spending at least one other day hiking in the Andes; doing a four-hour walk of Santiago; and going on a political tour. Have a look at this site http://www.hostalrioamazonas.cl/ It is where we will be living for the three weeks in Santiago. Pretty neat place!!! While it is snowing here today I believe the only ice you have to worry about in Santiago is the piece found at the bottom of a glass. The temperature is in the high 20s in Santiago today. Hard to take. 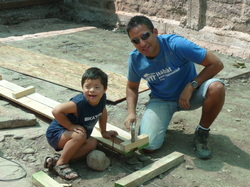 There's just a little more than a month before I head off to Santiago and my first Habitat for Humanity build. My flight leaves Ottawa at 8 p.m. March 7 and connects with the Santiago flight that leaves Toronto at 11:45 p.m. It's an all-nighter with a scheduled landing of noon the next day. At least one other member of the team will be on the same flight. My flying companion is Dianne and we have corresponded and agreed to do a bit of sightseeing together and a run or two when we get there. She, like me, likes to run. We are both plodders. Our team bios were distributed this week. There are 12 Canadians and two Americans. One of the Americans is Fred from Wisconsin. He's a retired musician and will be my roommate for the duration of the build. We are the same age, each of us has three kids and one grandchild and a partner who is still working. The rest of the crew are Cal, a 23-year-old from Saskatchewan; Hannah, a 24-year-old from Victoria; Tim is from Toronto and is probably in his late 50s; Jack and Diane from Ontario. He's retired and she's working on it; Emma and Michelle, a mother and daughter duo from London, Ontario; Kate and Pete are from Vancouver, are young and are the team leaders; Jena is another Ontarian who is also on her first Habitat build; and Leslie who lives in California and is a replacement for a team member who had to pull out because of illness. There is lots more on them but I will wait until I meet them before sharing that information. Looks like we have a good group of young and old and male and female.